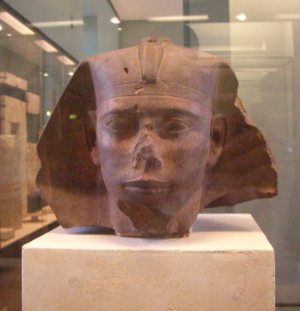 Khufu's successor was his short-lived son Djedefre, of whom little is known. It was presumably he who completed his father's burial at Giza and was especially responsible for the provision of his funerary boats (pp. 48-49). Djedefre's main significance is that he was the first king to adopt the name 'son of Re'. Moreover, for some unknown reason, he chose not only to construct his funerary monument some 5 miles (8 km) north of Giza on a commanding plateau at Abu Roash, but also to revert to an earlier style of building. Instead of erecting his pyramid and then cutting down into the bedrock to construct a burial chamber, he followed the 3rd Dynasty practice of excavating a huge open trench terminating in a vertical shaft. It is extremely difficult because of the site's heavily denuded state to make much sense of Djedefre's complex. There was a causeway, but this ran north-south rather than the more usual east-west; no valley temple has been found, and only the rough ground plan of a mudbrick mortuary temple was traceable, with difficulty, in the usual place on the east face of the pyramid. To the south, a deep pit may indicate the provision of a funerary boat. These aspects explain why it was thought to be unfinished. However, recent excavations (1995-2005) have revealed that the pyramid was finished, but extensively robbed in later periods, and the king's statues smashed as late as the 2nd century AD. From the French excavations at Abu Roash in 1907 came a striking dark red quartzite head of the king wearing the nemes headdress; a small statuette of his son, Setka, shown as a squatting scribe in the traditional posture; and the lower half of a statuette of the king with his wife. The quality and style of these three pieces (all now in the Louvre, Paris) show that the tradition of 4th Dynasty art was firmly established by this reign. About a mile to the south of Giza, at Zawiyet el-Aryan, is an unascribed structure that is very similar in construction to Djedefre's pyramid, sharing the plan of a deep open trench. At the bottom of a deep shaft, sunk into the floor, was found an uninscribed oval granite sarcophagus. Two names have been recorded from the site: one, in red paint on some blocks, may be read as Nebka; the other was that of Djedefre, inscribed on a schist plaque. Neither serves as a strong attribution for the pyramid, although its construction technique would place it close in date to that of Djedefre. It presumably belonged to an obscure king of the 4th Dynasty, but the difficulty is to identify one and also where in the known sequence of 4th Dynasty kings he might fall.